Whether your traffic operation is committed to a particular Caltrans 33x spec or a Type 1, Type 2 or modified hybrid traffic cabinet, a few key considerations can save time and money in deployment. Ideally, intersection studies would be completed of all current and potential traffic mitigation and data delivery technologies that are and may be employed. A defined standard would be incorporated ensuring all current and future technologies could be deployed. Though some intersections require different equipment, most agencies will engineer 2 to 5 models to facilitate basic and unique characteristics of each intersection. From this, a template or a kit can be engineered to include a unique part number or SKU. This logic is the basis of an integral part in a “turnkey” system. A good traffic systems or ITS systems shop can deliver most of the needs above as described, but what about a project that incorporates a large need for data/fiber? How about a project for V2X or Smart City that requires multiple agencies with multiple standards wishing to drive, deliver and share data over a common network? With the age of autonomous vehicles rapidly approaching, the time is now to review, augment, install or replace your current infrastructure. Big Data will reign supreme and that data will have to be captured, analyzed, and delivered much faster than older data infrastructure will allow. The communication link will be deemed “mission critical” with an emphasis on high availability. Wouldn’t it make sense to add an Eco-partner that manufactures, engineers and bundles such solutions and one who is responsive to changes and customization of these solutions? From engineering, to manufacturing and delivery, Multilink is a unique brand of value. Our products and services include cabinets, enclosures, battery backup, intelligent power delivery, indoor & OSP fiber products. We offer training as well custom design. Whether you are a Traffic Agency, Consultant, ITS/DOT solutions provider or infrastructure contractor, give us a call and learn more about how we can save you time and money on your next project. The 336S is a traffic control cabinet that meets NEMA 3R specifications. It is designed to meet the DOT cabinet standard specifications. This cabinet can house all vital intersection electronic equipment that manages traffic flow and assures safety for all roadway users. It can come equipped with Multilink's Life Saver Roof technology which extends the life of electronic components in your DOT cabinets. Rigurously tested, the Life Saver roof has outperformed its biggest competitors in the stove top shielded and stove top unshielded designs. Both doors come with Door Louvers and Air Filters. The cabinet can have a natural, anodized powder coat or anti-grafiti coat with restrictions on the color options. 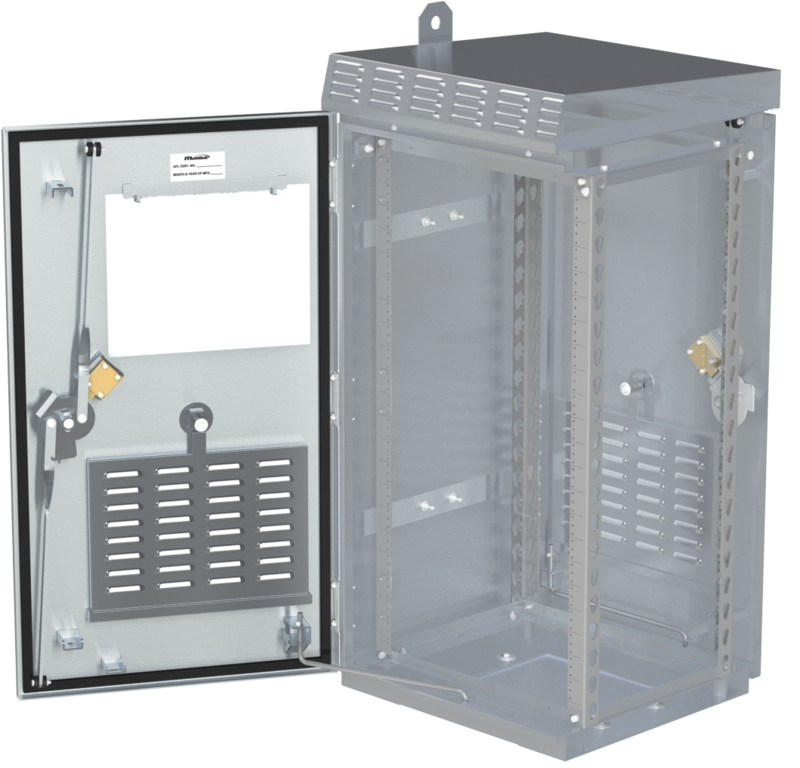 The 336S Traffic Control Cabinet can be ground or pole mounted depending on your project! The Multilink 2kVA Double Conversion Unit is an uninterruptible power supply designed to provide high quality, stable AC power to critical equipment that requires continuous, regulated power. With a pure sine wave output, the Multilink 2kVA Double Conversion Unit provides less electrical interference to sensitive loads with zero loss in output power. With 4 LEDs and a 4 line LCD display, UPS operating statistics scroll across the screen to provide at-a-glance monitoring. Ethernet connectivity is standard and includes an on-board web page for status monitoring and configuration. Compatibility with generators using the Safety Automatic Transfer Switch (SATS) provides lasting back-up power during long utility outages and low battery shutdown. The Multilink 2kVA Double Conversion Unit is scalable to provide the most efficiency with superior confidence. With remote deployment and use in Department of Transportation and Intelligent Traffic Systems in mind, the Smart Tracker Outlet Strip is designed to provide 8 resettable outlets for any piece of equipment that may be attached to the Smart Tracker. Each Smart Tracker is Ethernet ready and provides up-to-date operating parameters through an on board webpage. With the click of a button, the user can reset a remote device without the need to issue a technician to the site for manual resetting. Schedule devices on each outlet to turn off/on at specific time intervals. 8 digital output relays and 8 digital inputs , provide multi-purpose use to conflict monitoring equipment and/or additional reporting to the network operations center. Built-in analog DC voltage inputs provide battery voltage readings. Built-in temperature and humidity sensors provide environmental parameters. With GPS tracking you will know the exact location of each Smart Tracker deployed in your system. The Smart Tracker Outlet Strip can provide event logs for each event that takes place on its outlets, digital inputs, or outputs. The Smart Tracker Outlet Strip is your final solution to remote equipment deployment in the DOT/ITS market. The Safety Automatic Transfer Switch (SATS) is an integral part of an Uninterruptible Power Supply (UPS) or Battery Backup system. Its intended usage is to provide multiple sources of AC power in order to operate traffic signals, conflict monitors, camera equipment, lighting, and additional applications used in Departments of Transportation and Intelligent Traffic Systems (DOT/ITS). With utility line voltage applied and an UPS activated, the SATS will automatically begin to power the load with the UPS’ regulated output voltage. It also allows the technician to perform utility line, UPS, or generator maintenance without disrupting power to the traffic equipment. Click below to contact a Multilink Representative in your area and learn more about the opportunities we can offer!